and chairs create an inviting atmosphere. Comfortable and durable, Café Outdoor dining furniture is installed in cafés, restaurants, country clubs, hotels and resorts from coast to coast. 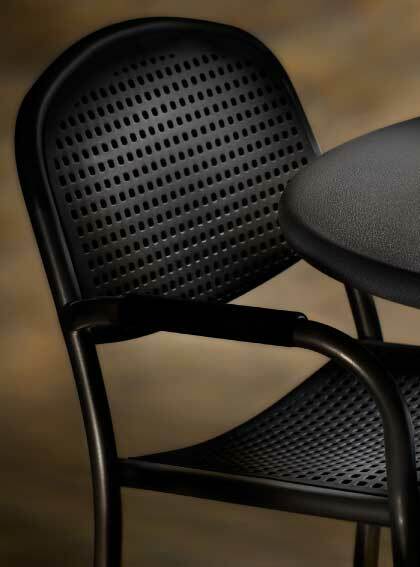 With classic good looks that fit both indoor and outdoor settings, our tables and chairs create an elegant impression in food courts, hospitals, conference centers, corporate dining facilities, museums, zoos and botanical gardens throughout North America. With powder-coated metal frames and polypropylene plastic inserts, Café Outdoor furniture is available in four different color combinations to complement any setting. The classic hammer-tone silver frames with black inserts offer a gleaming, contemporary look. Bronze frames with black inserts display a rich, elegant appearance. Titanium frames with black inserts make a classic, sophisticated impression. Mottled grey frames with tan inserts offer a light and inviting alternative for casual settings.